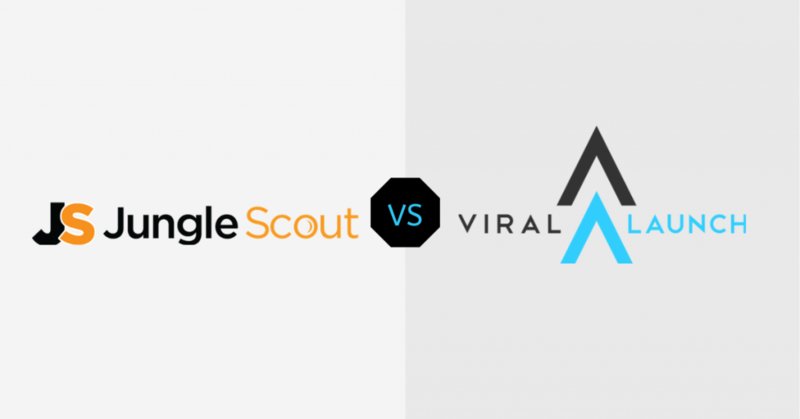 JungleScout vs Viral Launch : Which is Better? It’s every marketer’s dream to sit back on their couch while revenue pours into their bank account. It happens with online businesses. One area where some online entrepreneurs are making big money is selling on Amazon, but just like every successful business, it doesn’t come easy. The first key to succeeding as an Amazon seller is to evaluate the market, and what comes to mind is – product research software. Granted, many people cringe at the thought of letting a tool analyze the market for them, but a lot more have used a combination of research tools and strategies to succeed in the market. However you feel about it, project research tools are one of the best things to happen to Amazon FBA. Yes, using a product research tool more than doubles your chances of making huge money as an Amazon seller, but you must be careful about which tool you use. 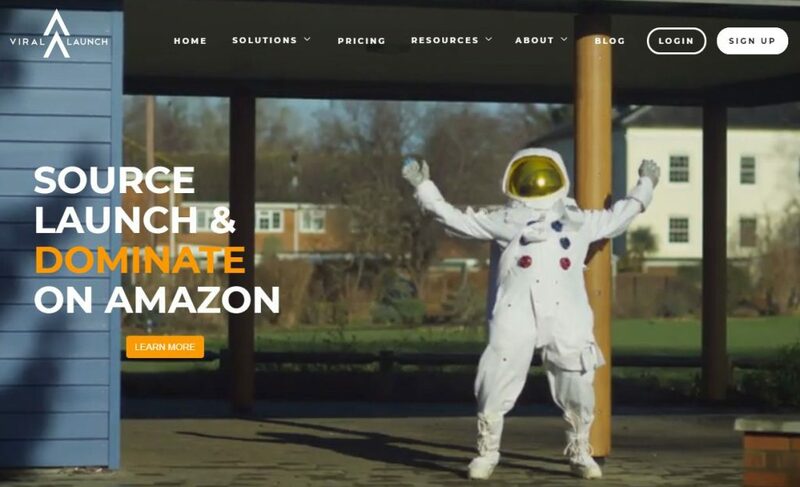 This post will cover two of the best Amazon product research tools – JungleScout and Viral launch. Jungle Scout lets you quickly and easily find profitable products on Amazon. Anyone selling on Amazon can use JungleScout, but it is especially recommended to people who are looking to import products, add private labels, and resell them through their Fulfillment by Amazon program. This is not just a ‘praise-filled’ review. We will talk about two problems you might encounter with JungleScout that you need to know about before you buy it. 1. It makes you tons of money because it helps you find profitable products. 2. It will save you money because it will stop you from losing money on products that will not be good to sell on Amazon. 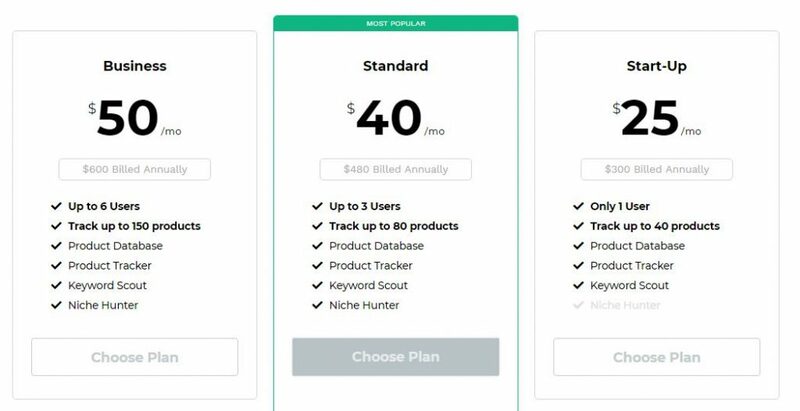 But while it’s great, you may be wondering about the different pricing plans and subscription JungleScout has. The truth is, you may not need to buy the most expensive plan. In fact, chances are you will be just fine with their least expensive plan. So in this review, we will look extensively into the different tools that JungleScout offers, and the different features that the pricing plan has so that you can pick the right pricing plan for the stage that you are at in your business. That way you don’t end up buying something that you don’t need. Their web app and its Chrome browser extension. Both of these tools are crucial to have if you want to locate the best products to import, private label, and then sell using the Amazon FBA program. The first step is to use the web app to identify products that have potential. Then, use the Chrome browser extension for the products that you found with the web app, and pick the best product from there. Let’s first talk about the Chrome browser extension, because that’s probably the tool that most people are interested in when they are reading this review. 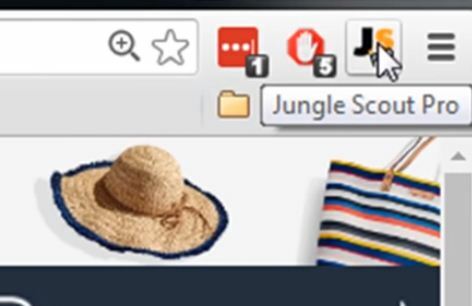 Obviously, the Chrome browser extension can only work with a Chrome browser, so you have to make sure you have it before purchasing JungleScout. You can go to Amazon’s website and load up the category of the type of item you are thinking of analyzing, or you can simply do a search for it. Allow Amazon to load up the competitors that you want to analyze, then go up to your chrome browser extension button and click on it. What will happen is that JungleScout will load up a bunch of very important data about the different listings. One awesome thing about this extension is that you do not have to go into each listing, one after another, before you can see more details about it. At one glance, you get information about the price, rank, brand, etc. The web app has two editions: It has the pro edition and the lite version. The main difference between both versions is that the pro edition lets you add extra columns that provide you with extra data about the different listings. These extra columns are very important because when you are looking for items that you want to import in private label and then sell on Amazon, you really want to make sure the item does not weigh much. If it weighs a lot, it will become very expensive and hard to ship. With a pro account, you can select the item weight from the additional column options to analyze the weight of these items so that you can assess whether you could create a similar item that doesn’t weigh that much. So as you can see, the JungleScout Chrome browser app is an extremely valuable tool that lets you analyze a product niche and quickly identify, at a glance, if it has a high potential for profit with low competition from other sellers. Now to the web app and its features. To get started with the JungleScout web application, login to your JungleScout account. The first page that you will see is your product tracker. The product tracker is included in all levels of JungleScout web app depending on how big of a subscription you have or how many products you can track. Ideally, you can see the average price for the item you are tracking, the average rank it has, the average number of units sold per day, and thus the average daily revenue. You can find out deeper information about an item, like the daily data trend in sales for the particular item. You can even go a step further to see the data trend for a number of days, that way, it lets you see if an item has just spiked over the last couple of days so that you don’t invest in a product that doesn’t have consistency. The additional product details hold some other valuable information, such as the weight for errors and the average ratings. You will have to go into Amazon to check out that data. The product tracker is a really nifty feature of JungleScout. The product database is where you are going to be spending most of your time within the web app, and this is how you are going to find products that have potential that you will then analyze deeper using the JungleScout Chrome plugin extension. This feature works exactly the same, whether you have a startup, standard, or business subscription. To get started, select the category you want. The next thing you want to do is to select the price. To get the best result, look for products that cost around $20 to $40 on Amazon. This is because products that are priced more than $40 seem to be quite big items or else they tend to be items that are expensive to manufacture. If you are just getting started, you probably want to have a low startup cost. Next is the estimated sales tab. 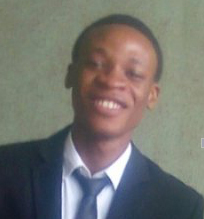 You will want to make sure to search for a product with a minimum of 300 sales when you are looking for potentials that indicate that a product is selling really well. If it has sold over 300 units a day, that’s a lot of potential revenue. From the reviews, you will want to set a maximum of 50 reviews, because if you can find an item that is making 300 sales a day, but has less than 50 reviews, it indicates that the competition for that item is really low, but the demand is really high, which makes it a perfect item to sell. It is also very crucial that you pick an item that doesn’t weigh very much, so a maximum of 2 pounds is recommended. When you ask JungleScout to filter the database, it will load up all of the different products on Amazon that meet your criteria, and this just saves you so much time. Any product that meets these criteria has a strong potential for being a great item for relabeling and resale. Finding items like these will normally take you days and weeks on Amazon. Chrome extension, it is an absolute must for any FBA private seller. At the beginning of this article, I promised to talk about two glitches that the JungleScout web app has that you need to know about before you buy. The first glitch is pretty easy to avoid. Remember in the product database, you can set JungleScout to only show items that have 50 reviews or less? Well, it normally does this very well, but sometimes it may show you an item with zero reviews, but have a star rating, which makes no sense. If an item has no reviews, it shouldn’t have a star-rating. If you open the item on Amazon, you will find out that JungleScout has glitched and added an item that has more than 50 reviews, and that’s why it says zero. Take note that it is a glitch and ignore it. 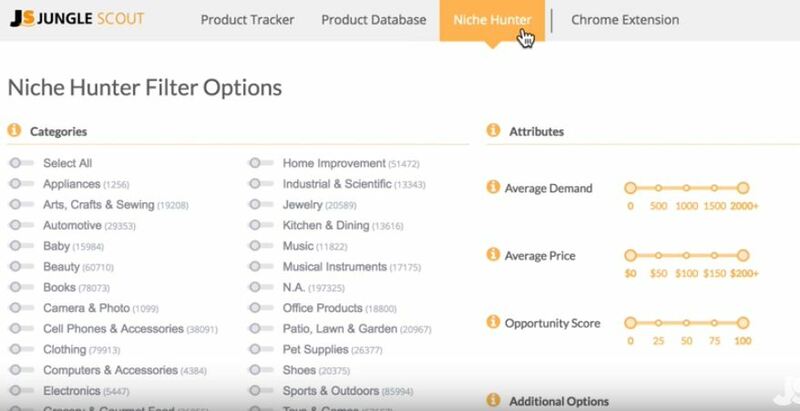 The Niche Hunter feature is only included in the standard and the business subscriptions of the web app. It is one of the major selling points that separates the standard and the business subscriptions of the web app from the cheaper startup version. It contains various useful filters. First is the average demand, which represents how many sales you can expect to get on a monthly basis. You will probably want at least 300, because any lower will mean that the product may not be selling very well. The next filter is the average price, which is pretty straightforward. Then, there is the opportunity score, which is a combination of the demand, competition, and listing quality all put into one to make it as easy as possible for you to find good products. Using the competition filter, you can find products that have low competition so that you are not competing with lots of other sellers to sell that item. Having high competition can make it hard for your product listing to stand out. There is also the listing quality score filter that helps you better convert visits into sales. It takes into account your titles, photos, bullet points, keywords, and description. This is a filter where you want the score to be lower, that means that products that already exist have a low-quality listing score which gives you the opportunity to improve upon that score. Now to the second glitch. The point of the Niche Hunter is to analyze overall niches rather than individual, specific items and listings. The problem is that it doesn’t pull data reliably all the time. For example, let’s assume you have selected a category, and inserted the necessary filters; it will give you your result alright. The problem though is that, if you open it further to get more results, it often shows that the top result has the appropriate amount of reviews, but subsequent products have zero reviews. If you check these products out on Amazon, you will find that they do not have zero reviews. On the contrary, they even exceed 50, making it over-competitive. The Niche Hunter feature is not available with the cheaper startup feature, but I don’t find it a great loss at all. 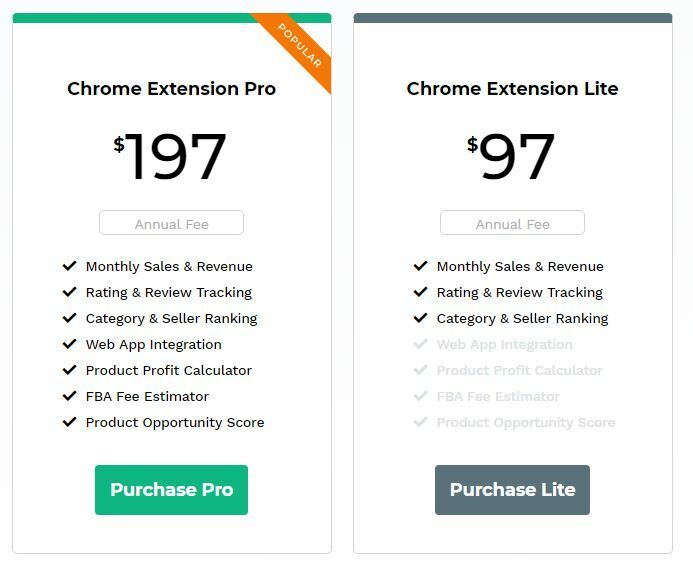 The JungleScout Chrome extension is priced at $197 and $97 for its pro and lite versions respectively. The web app plans are priced at $24, $40, and $50, for the startup, standard, and business plans respectively. 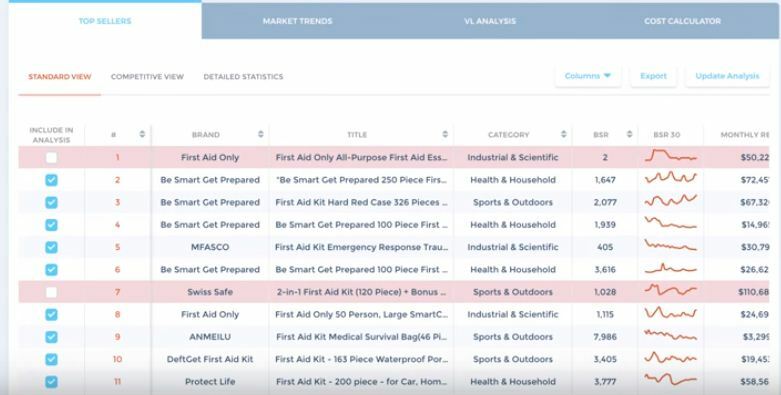 Viral Launch is a product research software alright, but on top of the platform, it has sub-tools that can help your FBA business tremendously. For example, Viral Launch has its own launching service that takes care of your giveaways, if you decide to do them. They also have a keyword research tool, listing optimizer, product photography, and much more. You will not be wrong to call Viral Launch JungleScout’s pro extension, JungleScout product database, and Merchant Words, all in one. So you can have a one-stop shop for everything product research tool related. If you look at the product discovery from Viral Launch, they provide product searches, just like JungleScout. You can put the maximum and minimum monthly sales, revenue, price and review count, and all the categories as well. But you can also set filters, such as initial investment costs, initial net profit, the average profit margin, the total net profit, and all that kind of stuff. They also give you a sales change. For example, they may tell you that the iPhone XS charger price has gone up by 2% and sales have gone up by 110%. This is incredibly valuable for sellers who are looking for in-depth data about a market. This tool processes a ton of real-time and historical data to generate statistical correlations and define sales trends. The feature uses a complex algorithm that has been set to cut out underwhelming products and source only money-making ones. In the process, it helps you estimate Amazon sales and validate or invalidate your net product idea using its product idea score. For example, if the system gives your product a 5-star rating, it means that the product will perform very well in the market. Lower ratings mean that the product will not perform as well, so aside from helping you make informed decisions, this feature also saves you from wasting good money on bad products. Of course, you will want to do this search on the Amazon website, so you can download the Chrome extension and use it directly from Amazon itself, rather than do it on your dashboard. The Viral Launch keyword research tool looks very similar to the Product Discovery, where you can actually search for a keyword or product. The very nice thing about the Viral Launch research tool is that you can select different markets. Merchant Word uses Google and Amazon to find its keywords, whereas Viral Launch only uses Amazon’s history of convergence and doesn’t only look to find those keywords from the top sellers. Viral Launch has a similar system where sellers use the reverse ASIN method to find top competitors that are selling the same products that they are, only the Viral Launch approach is more enhanced. With this tool, you can enter your keyword for a product and get a massive list of their top performing and underperforming keywords. It also gives you the ability to analyze and track indexation, keyword rank, sponsored ads, sales, price, reviews, search volumes, notifications, and so on. Viral Launch offers four pricing tiers. 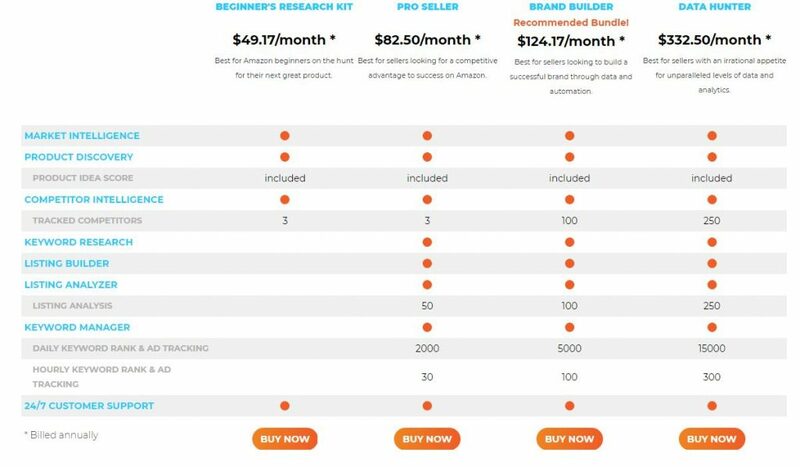 The Beginner’s Research Kit plan costs $49.17/month, the Pro Seller runs $82.50/month, the Brand Builder costs $124.17/month and the Data Hunter plan is $332.50/month. JungleScout and Viral Launch are two amazing tools by their own rights. One is not necessarily better than the other, they are just better at different things. Viral Launch slightly wins this one though, because its Chrome extension and web app give you a little bit more sales data, and it is more advanced. It has a lot more filters that you can use, which makes it basically a beefed up version of the JungleScout web app. But, with all that said, it will make sense to use both options. That way you can check against them, and since both are amazing, it gives you another layer of confidence in your FBA business.